Solar DAO is actively developing, over the past six months we’ve made a great progress. We love and appreciate our Community and we are also grateful to the Pre-ICO participants for their faith in project and its support. We decided not to run the ICO. Really. For now there are 1’172’767 SDAO released and no more tokens will be issued. As we reported earlier, the bulk of funds for Project’s implementation will be attracted and formed in** Private Equity Fund**. We’ve attracted new partners and institutional investors, collecting preliminary commitments worth several millions. Thus, Solar DAO does not need the ICO. We have already secured the support of early and institutional investors. Next step is to construct PV solar plants (PVS). First of all, today’s holders of SDAO tokens are the only owners. Collected funds are enough to start the construction of solar plants. More funds will be attracted in classic way to the main Fund. PR campaign will attract to get SDAO but only from exchanges. Recently the Solar DAO project was presented at the Roadshow made by the Monaco Growth Forum. 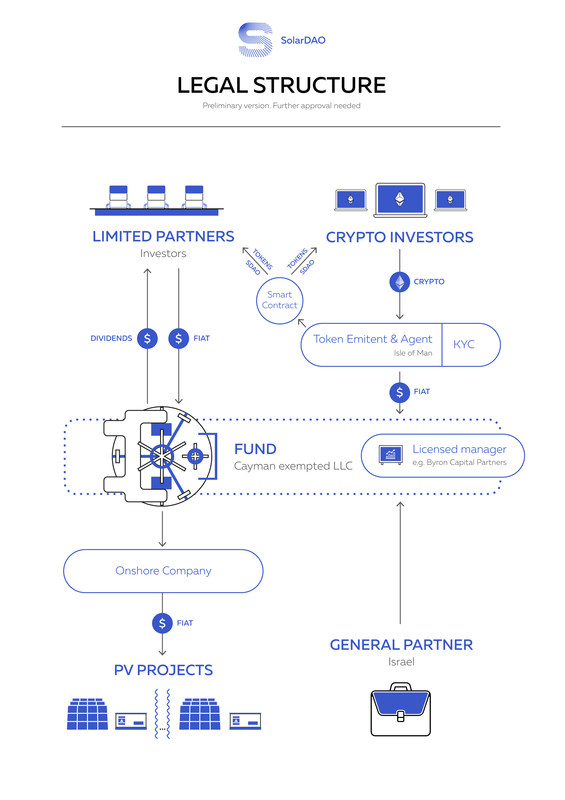 Solar DAO has been represented to over 200 investor (Family Offices, Private Investors and Funds) in 5 major financial centers of Europe (London, Zurich, Geneva, Lugano, Milano). We got positive feedback and currently working with the people we met. Currently we are still working at solar projects selection, evaluate them and conduct due diligence for every project that looks promising. We consider construction in Kazakhstan, Poland, France and Israel. We cannot guarantee these countries because of changing proposals. But our main goal is to begin construction in March 2018. Please note about the non-disclosure policy. We understand how important it is to know about upcoming projects, but the principle of interaction between partners is built on secrecy, based on the interests of both parties. Therefore, we will notify the Community of an exact project being implemented immediately after the final signing of all necessary documents. The first PVS construction will begin as soon as everything is ready for it. According to the planned legal structure, we need to conduct KYC (Know Your Customer) proceedure. Week ago, we started development of private area for SDAO token holders. We aim to launch it in February. To achieve the Projects goals, to maximize Project’s profitability and value of the SDAO tokens, we are launching new marketing campaign. Important! To get the best results and achieve the highest ROI for advertising, PR campaign will begin when the first solar plant construction begins. Increase activity in social networks. This week we are launching targeted ads in social networks based on the look a like mechanism, targeting the residents of the largest financial centers: London, Zurich, Frankfurt, Hong Kong, Singapore, Geneva, Munich and some others. We will place paid advertising in 100+ communities with our target audience. We’ve already started the formation of activity to get attention to Solar DAO in Reddit: r/CryptoCurrency, r/CryptoMarkets, r/investing, r/RenewableEnergy, r/solar, r/crypto, r/Bitcoin, r/InvestmentClub and others. Next week we will launch a Solar DAO advertisement with additional attention to a limited number of released tokens. No additional SDAO tokens will be released. No ICO. No Token sale. Fundraising will be held into Private Equity Fund and only from institutional investors. Solar DAO will become a part of this Fund. KYC procedure will be held for token holders. First PV solar plant construction should start in March. We are glad to present: the third exchange with our tokens: BITAFEX. Bitafex.com is a well known crypto-exchange that supports trading SDAO with all popular pairs: BTC, ETH, LTC, DOGE. Recently only a few could predict the rapid growth and development of ICOs. For reference, for the first half of 2017 in the world was attracted more than 1.3 billion dollars during the ICO. The popularity of this method of fundraising continues to gain momentum, and therefore there are difficulties that need to be overcome by future successful projects. One of them — the Isle of Man, where the Ministry of Finance sees financial prospects and is already developing its legal regulation. By the end of the year Gibraltar Blockchain Exchange plans to launch a service that allows licensed listing and digital tokens trading. In Estonia it is proposed to hold the first state ICO in the world. Another example is the Swiss “Cryptovalley” Zug. The government supports the established industry group for the management of blockchain assets. Tendencies and rules in the world of cryptocurrency and blockchain change constantly. We monitor the situation and continue to work on creating a legally correct structure for conducting a legal ICO. This is important, because those who conducted the ICO without regard to legal aspects, today faces the impossibility of withdrawing funds to Fiat. We do not want our investors to face such problems and continue to look for a solution.